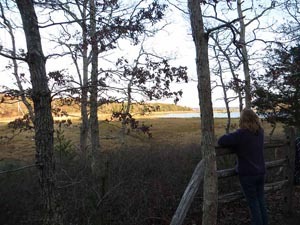 Here are some volunteer opportunities available with the Wareham Land Trust. If you don’t see one that interests you, invent your own. Use the form on this page or leave a message at 508-295-0211 to tell us how you would like to help. Enthusiastic volunteers are always welcome! Committee Member: Participate in planning and projects for the Stewardship, Acquisition, or Outreach Committee. Time Commitment: 6 hours per month. The Stewardship Committee oversees our conservation properties. The committee ensures that the WLT upholds its ethical obligation to protect the conservation values of the properties. The Acquisition Committee seeks out and evaluates potential land conservation projects, negotiates with donors, and prepares a financial plan for approved land acquisition projects. The Outreach Committee organizes events to engage the public through educational programs, such as lectures and nature outings, communicates with the media, and provides environmental awareness to the community. Property Steward: Be assigned to a WLT conservation property, periodically visit the property, annually monitor the property using specified methodology, and create a formal report on the findings. Some training provided. Time Commitment: approximately 12 hours a year. Property Maintenance: Mow lawns, repair fences, repair outbuildings, general landscaping, removal of trash and debris. Time Commitment: Varies. Office Aide: General tidying of office, filing, scanning, organizing, and computer updates. Some training provided. Time Commitment: 2 hours per week. Town Liaison: Attend periodic meetings and report back to the WLT. Choose one or more of the following meetings: Community Preservation Committee, Conservation Commission, Planning Board, CEDA, Open Space Committee, Water District—Wareham or Onset, Selectmen’s Meeting, and/or Zoning Board of Appeals. Time Commitment: 4 hours per month. Event Organizer: Become a member of the Outreach Committee. Solicit guest speakers in areas of interest to the WLT, secure a venue, prepare flyers, advertise event, and organize refreshments. Time Commitment: 6 hours per month. Grant Writer: Keep track of grants that we use to fund our land acquisitions, maintain comprehensive list of available grants, application deadlines and potential award dates, and assist in preparation of grants. Some training provided. Time Commitment: 4 hours per month. Blogger: Write articles about conservation and land trust issues. Researcher: Research ecological features in conservation areas owned by the WLT. Conduct bird surveys, wildlife / vegetation inventories, archeological investigations, or design and implement a research project of your own. This is an ideal opportunity for a self-directed project by a natural history student or any qualified individual. With your help, we can save more Wareham land, complete the form below.